Wholesale Solar’s pre-wired and tested Magnum MS4448PAE/2 Dual Inverter Power Center comes equipped with two Magnum Energy MS4448PAE 120/240 sinewave Inverters and a PT-100 Charge Controller to give you 8,800 watts of power. Mounted on a Magnum MBP-D double back plate, its sophisticated ME-RTR router organizes your connections and allows you to access information on each individual inverter. 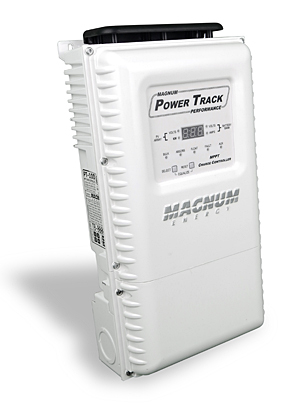 A Magnum Energy BMK battery monitor is included in this package, so you can keep an eye on your batteries' performance. The dual Magnum is 32" wide and 40" tall with 1 or no charge controllers. The unit is 9" deep when wall mounted. Since we have already assembled and tested this system, you will significantly save on time and/or labor costs it takes to put a system like this together. The cost of the components, when bought in a package, is also significantly lower. And because the MS Series inverters in this system are installed with a Magnum Energy panel and mounting plate, they carry a five-year warranty, rather than the standard three-year warranty. Feel free to click on the components below to learn more about what you're getting. You can also contact one of our sales technicians at 1-800-472-1142 or email us at[email protected].